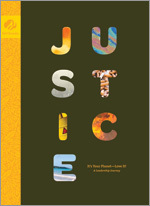 The Ambassador Justice and Adult Guide Journey Book Set includes the companion guide for adult volunteers offers key information about this journey, its awards, and its leadership benefits, along with step-by-step sample plans for sessions with the girls. The adult guides also feature Girl Scout history, tips for getting out in the great outdoors, details about how to add your own "bells and whistles" to the journeys in partnership with girls, and unique activity sheets. The Ambassador Justice and Adult Guide Journey Book Set is imported.